On the 28th and 29th of September, the Manifesto-Workshop, as part of the project “Alternative Europa!“, was hosted in the permanent Representation of the Freie Hansestadt Bremen in Berlin in order to continue the process o fcreating a manifesto with European political aspirations. During the workshop, working groups (AGs) concluded their work on a number of different papers and projects, as well as discussed the content and complexity of the manifesto. Subsequently, all participants debated regarding a draft for a manifesto on the future of Europe and the next approach for its application. 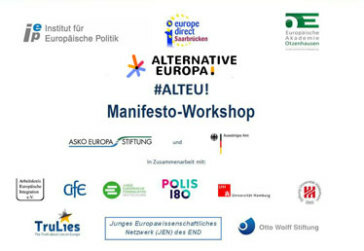 The workshop is part of the project “Alternative Europa!”, which was established by the Institute for European Politics (IEP) in cooperation with the Jungen Europawissenschaftlichen Netzwerk (JEN), the Europawissenschaftlichen Netzwerks Deutschland (END) and the Europäischen Akademie Otzenhausen (EAO), in close partnership with Polis180 and the Jungen Europäischen Föderalisten (JEF), as well as European Horizons. Other cooperation partners are the Arbeitskreis Europäische Integration (AEI), the Centre International de Formation Européenne (CIFE), the project „TruLies: The Truth about Lies on Europe“, the university of Hamburg and the university of Hildesheim.